What Asana Triggers and Actions are Supported? New Tag Created - Triggered when you create a new tag. New Story - Triggered when you add a new story. New Task in Project - Triggered when you add a new task to a project. Tag Added to Task - Triggered when you add a tag to a task. Updated Task in Project - Triggered when a task in a project is updated. New Subtask - Triggered when you add a new subtask. New Project - Triggered when you add a new project. New Workspace/Organization - Triggered when you add a new workspace/organization. New Team - Triggered when you add a new team. Completed Task in Project - Triggered when a task within a project is marked as completed. Does not trigger on completed subtasks. Create Story - Adds a new story (a comment is a story). Create Task - Adds a new task. Create Subtask - Adds a subtask to an existing task. Create Project - Adds a new project. Attach File - Attaches a File to a task. Update Task - Updates an existing Task. Add Task to Section of Project - Adds a task to a section of a project. Find Task by ID - Finds an existing task by its ID. 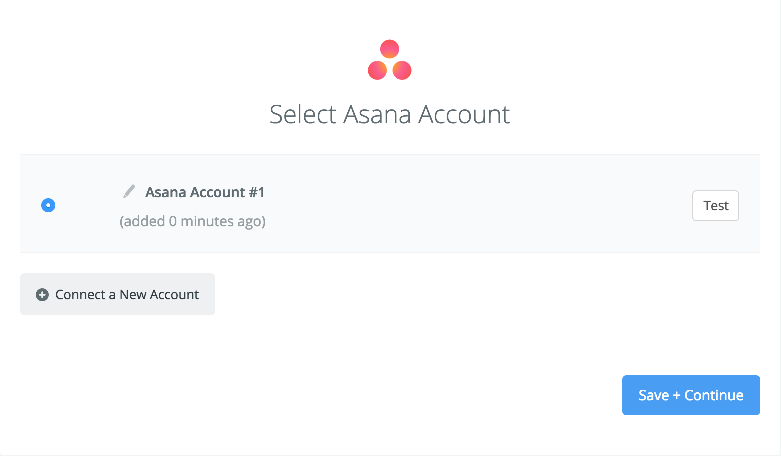 Find User - Finds an existing user of your Asana account. Find Section in Project - Finds an existing section within a workspace project. Find Task in Project - Finds an existing task within a workspace project. Unfortunately, at this time it's not possible to add a Tag to an existing task. We can add tags to brand new tasks you create from Zapier! At this time, Zapier is unable to create new task tags in Asana. Tagging tasks is limited to tags surfaced in the dropdown. 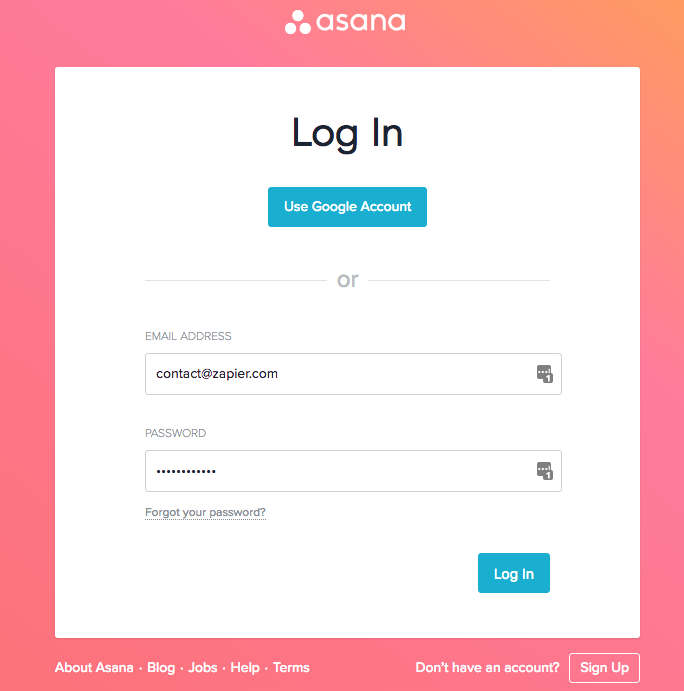 Unfortunately, there isn't a way to do this via Asana's API. One workaround is to use the "Tag Added to Task" Trigger, then add that Tag to each Task you want to trigger on in Asana. It's an extra step, but will save you from having to create a zap per project! If you get this error, the project you were using with Asana has likely been deleted. To fix this, go edit your Zap and select an existing project from your project dropdown for Asana. Unfortunately, the New project trigger does not work for accounts with more than 1,000 projects. You'll need to clear out some old projects from your account to use this trigger. While you can create tasks that don't have an assignee or project, those tasks are often difficult to find in Asana without searching for them. Only tasks that are assigned to you will appear in your My Tasks. Similarly, if a task does not belong to a project, it will not appear in any projects. We generally recommend that the Zap create the tasks with an assignee, or within a specific project. This way the task will be located within your My Tasks or the project when it is created. try moving completed tasks into another project. This error can happen when you have a very large number of completed tasks in a project. Asana's API does not support filtering out completed tasks with pagination in the way Zapier expects. Our best recommendation is to move completed tasks to another project if possible. That should keep the number of incomplete tasks low enough for your zap to function properly. This error can happen in the following triggers: "New Task in Project", "New Subtask", "Completed Task in Project".